While in high school, Aaron Smith*, a UC Santa Cruz student, was diagnosed with a functional somatic syndrome, which gave him widespread musculoskeletal pain. He spent years going to physical therapy and taking pain medication, which were mostly ineffective. After over a year of medical marijuana use with the support of his parents, Proposition 64 has made it more difficult for him and thousands of patients like him to purchase medical marijuana because of sharp price increases. While Proposition 64 allows adults to use marijuana recreationally, it also implements new taxes and regulations that increase the price of marijuana across the board. Taxes on marijuana have doubled from 16 to 32 percent in the city of Santa Cruz. This includes a 15 percent state marijuana tax, an 8 percent Santa Cruz city marijuana tax and an 8 percent state sales tax. There are also 8 percent taxes on cultivation, distribution and manufacturing in the city. “If they don’t fix the taxation rate, the whole system is going to implode and everyone is going to be forced back to the black market by the end of the year,” said CannaCruz dispensary CEO Grant Palmer. CannaCruz, previously a medical marijuana dispensary, now has twice as many recreational adult use customers as medical ones, Palmer said. About 80 percent of medical customers are unable to afford buying there after Proposition 64. This has pushed many medical users, including Smith, to buy their medicine off the street. Additionally, some dispensaries can be charged up to $72,000 in yearly fees to operate as medical distributors and another $72,000 for general adult use. Distribution fees can be up to $125,000 per year for adult use and another $125,000 for medical, according to Palmer. Lab testing prices also increased from about $100 to $700. These costs are all factored into the final cost of marijuana. 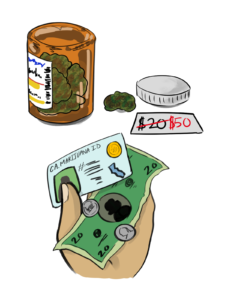 Because UCSC is federally funded and medical marijuana is not federally legal, nobody, including students with medical cards, is permitted to use marijuana on campus. Factors limiting medical marijuana use as a result of Proposition 64 have proven difficult to navigate, but Palmer thinks taxation and policies surrounding the law can be reformed to be more efficient. *Name changed to protect anonymity. Next articleGrammys: Still So White? Shinae Lee is Arts and Culture Editor for City on a Hill Press. She has reported for every desk at City on a Hill in her two years on the paper, but has focused most of her time until now as a campus reporter and editor. She describes her favorite reporting subject as, “in-depth stories about things that really matter to people.” Though she focuses much of her time on the newspaper, she is also a Feminist Studies major, vice president of the Korean American Student Association, print coordinator for Student Media and occasional babysitter. In her scarce and precious free time she can be found organizing her life artistically in her bullet journal, watching The Great British Baking Show or traveling on a budget.